Several days ago, I walked through one of the poorest places in the world: Korah. I've mentioned Korah in a few of my posts on Ethiopia so far, but here's a brief history of Korah and then some first-hand footage. Also below is an overview of Great Hope Church in Korah. In my next post, you will hear from my dear friend Sammy, who was my translator in Ethiopia and who is ministering in Korah. 75 years ago the village was established because of leprosy. The people came from the countryside to seek treatment for their illness. They came to ALERT Hospital, which was established by Dr. Ross, from the U.S. and a Dutch doctor named Chris Dorman. When they heard of the spread of leprosy, these two men approached King Hale Selase to request land to establish a hospital specifically for the treatment of leprosy. King Hale Selase was willing to give land, but only land that was far from the town and in the forest so as to keep the people with leprosy separate from everyone else. The two doctors started the hospital and began treating these patients who had immigrated from the countryside. These infected people came to the city because their family members believed they were cursed when they contracted leprosy. Some of these individuals were put into a separate hut when their disease was discovered and later their family tried to light their hut on fire. The family members were so convinced that the leprosy was a curse that they were willing to kill their own children. Some escaped from these hostile family members and came to Addis for treatment. After King Hale Selase lost power to the Communist Dirge Regime who took power over the lives of the people of Korah, matters only worsened. The regime wanted those with leprosy to be eliminated. Therefore, the military base close to the colony would often send out soldiers to beat and even slaughter residents of Korah. They thought it was better if these “lepers” were dead. Years ago, the impoverished people of Korah began sending their children to the nearby landfill (the king also put this far away from the city just like these people) to collect anything that seemed edible. To survive, these families consumed food that others had thrown away. This became their lives – waking every morning, no, running to the trash yard and fighting to salvage the best that could be found there for food, which was usually rotten. This is still happening today! After the communists had power for 17 years the revolutionaries took back control. With this change there came a new, yet disgraceful opportunity – this new government would actually let the “lepers” beg in the city. The statistics now show that there are approximately 75,000 people living in the Korah area. This community is made up of people with different backgrounds but one thing in common: poverty. The area is becoming a breeding ground for HIV as prostitution has become rampant in the community – a popular response to the poverty trap. Small moonshine houses are also a common business here as many men choose to drink as an escape from the realities of their lives. The name Korah came from the idea that the people in the community were cursed. For years people referred to the leprosy colony and those in it as the “Sons of Korah” who were swallowed up by the earth in the Old Testament because of their cursedness or sinfulness. Eventually this became the official name of the community, only exasperating their shame and rejection. The history of Korah is hard for many to hear or read of because of the many injustices that the community has faced. Today, these injustices have resulted in a community that needs the understanding, guidance and help of the church. There is much potential for this community of “rejects” and that is why this website and the ministries described herein exists. The Great Hope Church was established in Korah almost 5 years ago. The idea of the church came out of the burden a young man named Bisrat had for the desperate community of Korah. Bisrat, having come out of a past of rejection himself, felt lead to minister within this community. 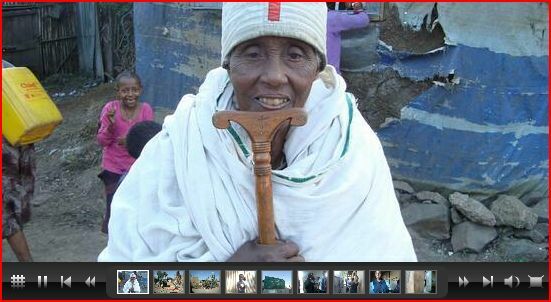 He was born in an Ethiopian Orthodox Monastary to a blind mother and father. Raised up as a devout orthodox, Bisrat knew everything about the church, but he did not know Jesus. One day he met a Priest who shared the Gospel message of Jesus Christ with him. Bisrat immediately accepted Jesus as his Savior and eventually began evangelizing his orthodox community. Due to his zealous behavior, Bisrat was thrown into the jail and then forced to leave the monistary he had grown up in.